It was afternoon, handover time at 1pm. We were told that that we were to have a cuddle with Joseph. I seem to think it was a Sunday, day 3 after his birth, but I could be wrong. I wish I'd dated the pics, but hey, my brain wasn't in that space to do so. I'm still in patient, as that's my pyjamas, and I'm still bruised from the anaesthetic. F and B were the nurses in charge of Joseph for his first weeks. They were so amazingly calm and unflappable. They treated me as part of the team, with utter respect. They made sure I was fully informed. If something was going on they weren't happy with they would whisper in my ear and tell me how to challenge. I loved them and still do. I gather they fought for this moment, and very calmly made sure NICU was quiet. F was in charge of taking Joseph out and placing him in my arms then we swapped so daddy could have a cuddle too. It was the most amazing moment of my life, this baby I had reluctantly delivered 3 months too soon was actually mine. When the cuddle was over, it was about 15 minutes, we went to the family area and I just howled and howled. I couldn't believe that I finally had a hold of my baby. But also it hit me how bloody long this road was going to be. He was so small, so fragile. I couldn't envisage the future. So I just only ever concentrated on the next milestone. You can eat an elephant, I'd recite to myself, just one bite at a time. And that's how I viewed his journey, just focus on the immediacy and don't look too far ahead. The next time I howled like that was week 9. There was a flurry of excitement on the Monday I came down to the ward. One of the nurses whispered "you have date! A date! 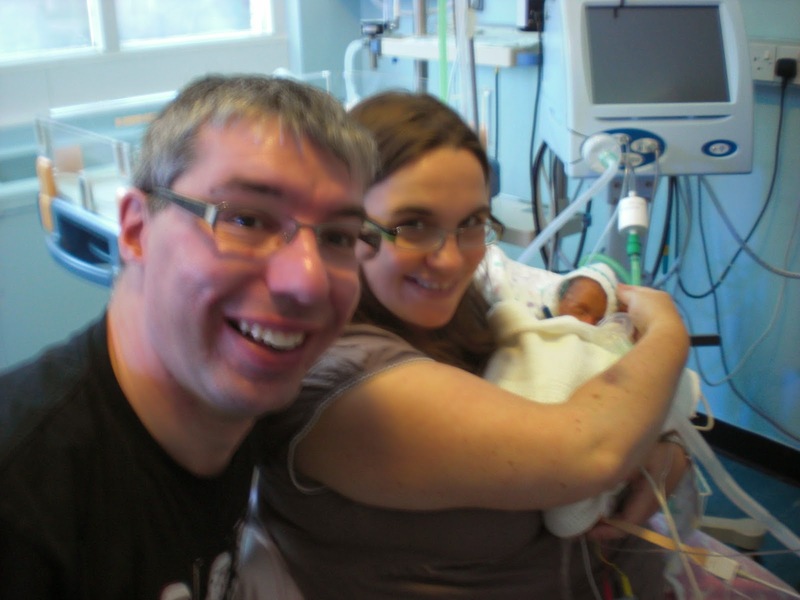 Joseph is going home next week, but look surprised when the consultant tells you." I froze. I didn't feel excited. I felt terror. A whole week for something to go wrong. Because in NICU you can never dare to hope too hard. Every day has trouble and challenges of its own. 7 days. A lot can happen in 7 days. The consultant came on her round and told me, all things being well Joseph would be coming home on Tuesday 21st July having been born on the 8th May. I cried. And cried. She was shocked. I revealed how hard the last 9 weeks had been, how I'd struggled, how lonely I'd felt, and she was so shocked and surprised as I'd kept so positive. Now I'd wished I had made more of a fuss and asked for help. The last week was utterly dreadful. Mostly it was ok, but he had to have his vaccinations (they'd forgotten at 8 weeks and did it at 10) and of course his CRP was raised. One of the doctors hadn't twigged he'd had his vaccinations decided he was ill, put him on his invasive monitoring again and threatened to delay discharge. Let's just say mummy lion when into full on protective eat the predator mode and the monitoring machine was quickly banished to the storage cupboard. Then at the very last minute the opthalmologist due to do the last ROP check was late. Joseph was awaiting this before going home. Then he arrived and the opthalmologist nurse had left. He talked about returning in a few days to do the test. Mummy lion growled, I will hold the baby and you will do the test. So I did. And it was done, and home we went. So long since that picture had been taken. But finally I got to take my baby home and have cuddles whenever we wanted. Seems like a lifetime ago. I remember you going through this and feeling tremendously proud of you how strong and determined you were. One amazing mummy lion. And daddy lion. And yes you did eat the elephant and had dessert.